Peter Parker's dear old Aunt May has gone and got herself engaged. That's right, the old maid is ready to take on a new suitor, and despite her previous missteps in the ways of love, (remember, this is the lass who once dated Doctor Octopus) in this instance she seems to have chosen wisely. The only snag? Her bubbling hubby-to-be just so happens to be the single father of a certain cigar-chomping, short-tempered, flat-topped newspaper editor by the name of J Jonah Jameson. If you can't see how that might throw Peter for a loop, well, perhaps it's time to catch up on the back-story a little bit. Marc Guggenheim's story offers a split focus – half on the engagement party and half on the ensuing super powered rumble that never seems to be more than three steps behind Parker at any point in his life. Watching Peter and Jonah snipe at each other from across a dinner table makes for a few amusing moments, but doesn't really add any insights into their relationship that weren't already common knowledge. If anything, Peter comes off every bit as petty and irritating as his longtime nemesis during that long, drab meal, which makes the whole ordeal even less appealing. If they're both being smarmy dickwads, whose side am I supposed to be on? It only gets worse when the action spills onto the streets and Guggenheim takes every possible opportunity to remind us that this story is taking place in Boston. Between the constant flaunting of the city's notorious accent, the excess of commentary from the peanut gallery and the random dude decked out from head to toe in Red Sox gear, I was ready for Spidey to start throwing punches at the crowd after three panels. Never has the word "wicked" been uttered so many times in a two-page span. While Pat Olliffe's accompanying artwork doesn't exactly benefit from the comparison to Olivier Coipel's gorgeous cover, it still manages to get the job done. If you're looking for anything more, though, you're out of luck because Olliffe doesn't bring much else to the table. His work is serviceable; it's easy to follow and fundamentally sound, but often overly safe and unspectacular. 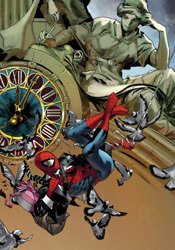 He paints the page with the same lack of excitement during Spidey's sudden brawl with a new masked opponent as he does Aunt May's hugs n' kisses with the future in-laws. It's a one-note approach, and while I can't really fault his technique, I'm not all that excited by it either. Match that with the grossly generic costume design he establishes for that new villain, dubbed Velociraptor, and you've got enough stale bread to feed a flock of seagulls. With artwork that could often be mistaken for fill-in work from the early 1990s and an excess of jokes that widely miss the mark, this would've been bad enough without the eyeball-rolling revelation near its conclusion. Even with the teaser that's dropped during those final pages, the lack of consequence present in this issue is staggering. The storytelling plays it so safe that I felt like I'd been running in place for thirty pages, and Guggenheim never makes amends. This issue deserves a special term all to itself, because somehow the word "filler" doesn't really do it justice. Even if you're a serious Spidey fanboy, skip it.